Consumer brand companies have been busy introducing campaigns like Heinzâ€™s that rely on user-generated content, an approach that combines the populist appeal of reality television with the old-fashioned gimmick of a sweepstakes to select a new advertising jingle. Pepsi, Jeep, Dove and Sprint have all staged promotions of this sort, as has Doritos, which proudly publicized in February that the consumers who made one of its Super Bowl ad did so on a $12 budget. This video is actually kind of funny if you are connoisseur of the intentionally lame slapstick YouTube aesthetic, but probably not ready for prime time. You may be wondering why I didn’t just embed the video here for your enjoyment — well, that would be because they turned that feature off. 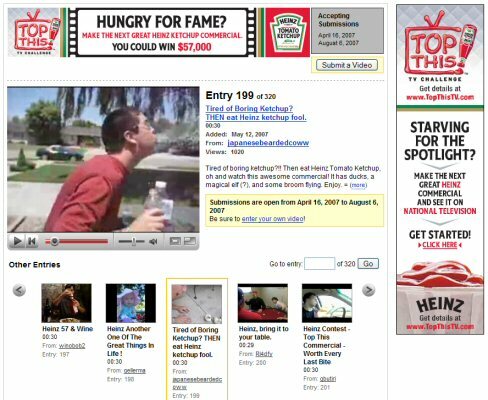 Heinz wouldn’t want users running off with their content, would they? That’s because the user really isn’t in control. Will Facebook Platform Be The New Arbiter Of Web 2.0?